With 2019 race season coming to a start, their will be one driver in Super Comp that will be running the number 11 this season. That driver is Kyle Bigley. Well recap his year to see how his points added up to a pretty impressive number. 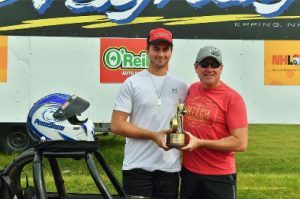 The “first race” of the season for him and many others took place at Maple Grove Raceway, the second stop on NHRA Division One’s Tour, ended quickly for him in round one, losing a close race. 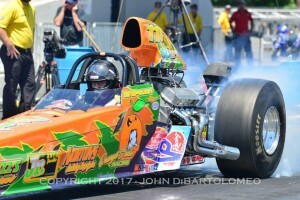 The start of maybe his best season ever had started in Numidia, PA. His home track, for the past couple of years has been bracket racing his dragster in Super Pro. So no better place he feels more comfortable, then up in the hills of Numidia. He found himself in a final round against very tough competitor Mike Robilitto, 2017 Division One S/C Champion. Tree dropped and everything fell in place, he was .002, and they both rolled through very close, Bigley slightly ahead by .002, bringing home his first Wally. Remember sitting in my car for round number two, and seeing Ed, his father working feverishly on the car, having a water pump failure, as Super Comp is running the round. People dumping bottles of water they had on them, to get the block filled up with water, fixing it just in time for their race. Adding his first 105 point total to the board. The next race was simply like walking around in an oven, temps boiling over 100, wearing everyone at the Lebanon Valley Divisional out. Kyle making a semi-final appearance and adding 83 points to his score, and the start of bigger problems for him engine wise. The week after the Lebanon race was Epping National, Bigley’s realizing they only have about 40 pounds of oil pressure, switching to thicker oil, “fixing” their problem. A couple more runs down the track, they realize what has to be done. A rebuild in the middle of the season, with championship contention, risking blowing it up isn’t an option. 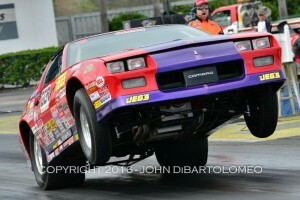 The motor is sent out, rebuilt, and reinstalled in the car in very quick time, not missing a single race. 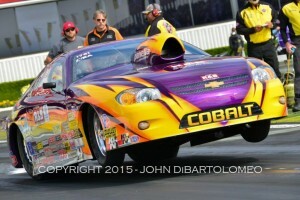 A red light ended him round one at Atco divisional, but many rounds are soon to go in his favor. Cecil County achieving a runner up on a Monday adding 84 more points to his total, then the next race followed by a win at Epping, adding another 105 points. The fourth round of this race was a very pivotal point of the season, Kyle lining up against Chris Garretson, was number two in points at the time. This was a very important race and Bigley got a huge break, Garretson running an 8.49 handing Bigley the win. Everyone in racing knows, you definitely need some type of luck to win these races and for Bigley, he was driving great, and had the luck when he needed it. A combination for winning a Championship as they did, totaling a very impressive 428 points, and the spot to represent Division One in this years Jeg’s Allstars. Also at the banquet, he received Division One Driver of the year award. Another trophy to add to his collection. With sights set on the 2019 Season he plans on sticking to what they did good at, running Super Comp. 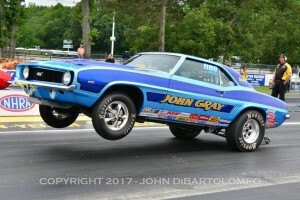 He is also planning on running Super Street in 2019 with his father’s Firebird, assuming his driving style it will be one of the faster cars in the class. Just a short side note, as the looks of it there will be a handful of new cars out for 2019, can’t wait to see what people have in store. I believe they also plan on running a few more National events, last year only attending one. He had a good shot at a single digit number, if he did run some Nationals. Division One having number five in the world Mike Robilitto and number six Chris Garretson, Bigley could definitely been a third. With a dream season in the book, we will see what 2019 has to offer for Kyle, Congrats on the great year.